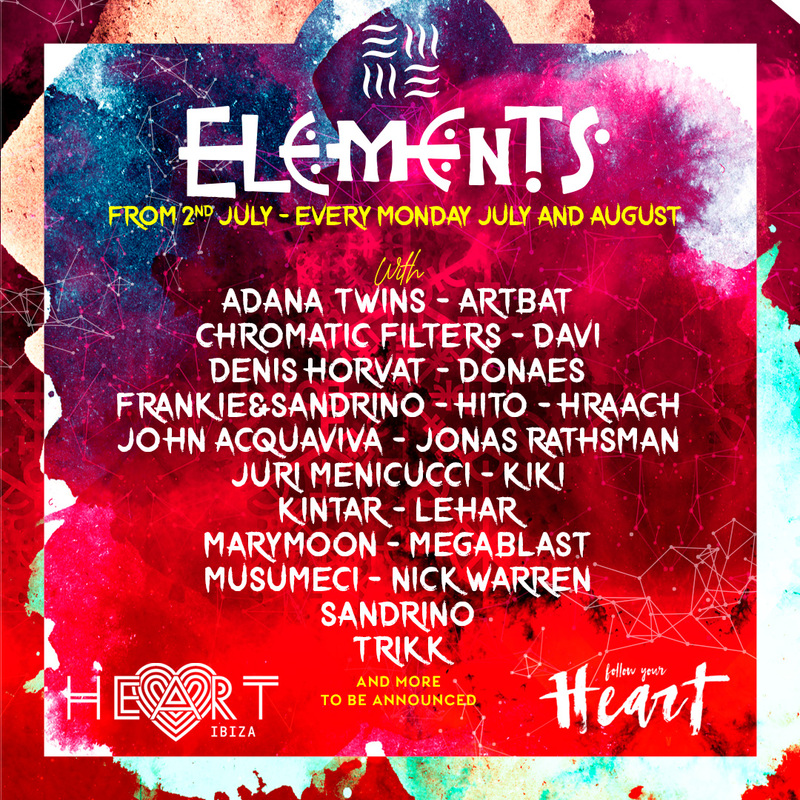 From 00:00 to 6:30 a.m.
After four dazzling dates last summer, Elements at HEART returns to the lavish Marina Botafoch nightclub for a full season. Bringing the charming style, magical vibe and unique concept to HEART Ibiza, Elements Ibiza delivers an impeccable line-up and mind-blowing production exploring the elements of nature and life. Taking on a weekly appointment, it is set to bring an even bigger line-up than last year to the island for a summer of incredible shows that cover all shades of underground ethnic electronic music, including some of the finest electronic music talent currently on the scene. Like the rest of the season, the opening party sees three exceptional underground electronic music acts renowned for their ability to combine ancient and modern sounds. The house maestro Sandrino – one half of duo Frankey & Sandrino – will be spinning his deep and melodic musical tales. Also on the decks that first night, the Ibiza-based DJ and producer Kintar will be adding his unique blend of ethnic and mystic sounds. Finally, newcomer Hito, who has been wowing underground clubbers in Tokyo, Berlin and Ibiza alike with her raw techno elegance, will be completing the line-up. The rest of the season includes more electronic music wonders such as Adana Twins, Artbat, Chromatic Filters, Daví, Denis Horvat, Doanes, Frankey & Sandrino, Hito, Hraach, John Acquaviva, Jonas Rathsman, Juri Menicucci, Kiki, Kintar, Lehar, Marymoon, Megablast, Musumeci, Nick Warren, Sandrino, Trikk, amongst others. On a visual level, the event presents the four elements in all their mystery, marvel and magic. The first date sees all four elements – water, air, fire and earth – represented at once in creative and original productions that left people talking for months after the event’s four dates last summer. This year, the open-air terrace at HEART Ibiza will also be taking on an entirely new look. Interactive experiences and decorations inspired by the elements see art exhibits, live art performances and healing experiences transforming the picturesque space overlooking the port of Ibiza Town and Dalt Vila. The essence, spirit and flair of the inimitable beach club will come to life once again in its night version with an extra twist.